I have been sharing more Bakes (sweets) than Eats (savouries) in my Kitchen Exploits series. The main reason for this is because I like to eat my food piping hot. Most desserts can be eaten cooled or cold, leaving me time to photograph them properly. When it comes to main courses though, especially meats, I want to see steam coming out of the food when I eat! Nothing fancy. Ugly, almost. This, in particular, wasn't even my best chicken. In a bid to share a recipe that actually results in great tasting rather than just good-looking food - I'm posting my Roast Chicken recipe. 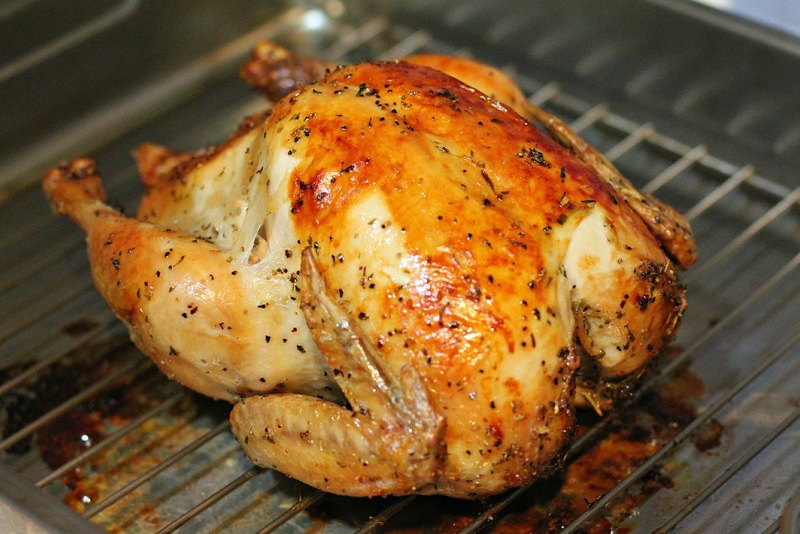 I have dabbled with making roast chicken several times, serving up either too dry meat, soggy skin or unbalanced seasonings. This version is what my family enjoys most. I use the drippings to make gravies, and boil up the bones to make delicious stock. Leftover meat usually gets shredded to be put into sandwiches or tortilla wraps the next day. If I have fridge space, I like to roast 2 chickens at a go, saving time. I spent quite a bit of time figuring out the timing and temperatures to roast the chickens. It may sound complicated, but really not difficult once you get used to it. I've gotten perfectly tender meats and crispy skin from this method. If you have fresh herbs, by all means use them. I use dried ones because the flavours are intense, and they are convenient! 1. Cut lemon into half. Squeeze the juice of one half into a bowl. 2. Add salt, black pepper, mixed herbs and olive oil into the bowl of lemon juice. Mix well. 3. Rub mixture onto whole chicken, including the cavity, loosing the skin as you do so. 4. Stuff chicken with the other half of the lemon, onion, garlic and lemongrass. 5. Leave the chicken to marinade for at least 3 hours, turning it now and then when you remember to. 2. Place chicken, breast up, on a roasting rack, and fully cover with foil. 3. Put chicken in oven on middle rack and set timer for 30 minutes. 4. Turn temperature down to 190C without opening oven door. Set timer for another 30 minutes. 5. Take the chicken out and close the oven door. Remove the foil. Use a spoon to scoop drippings (if any) and pour it over chicken. You will get more drippings if you roast 2 chickens at once. If there are not enough drippings, quickly pour 2t olive oil over chicken. Place uncovered chicken back in oven and set timer for 20 minutes. 6. Without opening the oven door, turn on the oven fan. Roast for another 15-20 minutes. 7. Take chicken out and test that juices run clear by poking a skewer into the fleshiest part of the thigh joint. 8. Over chicken with foil and let it rest for 10-15 minutes before carving/serving. 9. Serve with potatoes and greens. Your chicken looks good what! :) I'm going to try it. Thanks for sharing the recipe! It's v detailed! You think so? Yay! I saw too many flaws in it (eg. broken skin in one part)- but that's just the visual me speaking. Hope you like it! Yes I had this piece of paper stuck to the fridge where I wrote down adjustments to timing, temperature etc. Recipe is a result of the experiments! Thank you! Hope it works out for you :) Do share when you do! I had dinner not long ago, but looking at this has made me hungry again! To me it looks perfect! Roast chicken is the ultimate comfort food.